Saturday 9th April 2016 will see NIMRA host a British Championship round fell race covering a horseshoe route taking in Slieve Donard and Commedagh. 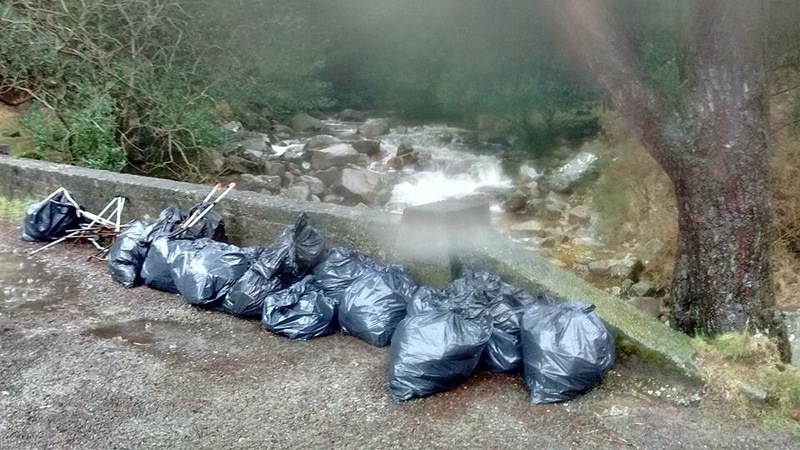 In an effort to address the increasing litter issues within Donard Wood, and hotspots of the high cols and stiles along the race route, NIMRA requested running clubs assist with a litter sweep over the weekend of Sat-Sun 2/3 April. To this call, BARF took up the challenge and turned out in numbers over both days and assisted fellow runners with sweeps in Donard Wood on Sat morning and high cols/stiles on Sun morning. This proved to be a great success as evident by the vast amount of rubbish lifted and removed. The efforts over the 2 days were recognised by passing members of the public who praised the actions…and even joined in. A big thank you to all involved. Good luck to all running in the Championship race…and hopefully you will notice a great improvement in the environment! This entry was posted in Other and tagged fell running, mountain running, moure mountains, mournes, slieve donard, trail running, ultra running on April 6, 2016 by Aaron.